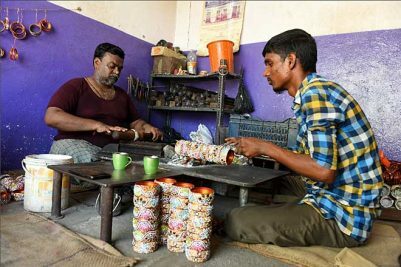 Hyderabad: To say that the popularity chart of the ruling Telangana Rashtra Samiti (TRS) has been pushing north would be to state the obvious, particularly after its stupendous performance in the last Assembly elections when it won 88 of the 119 Assembly seats in the State. Three months down the line, after the Assembly elections, the party has galloped ahead to touch the 100-seat mark with at least eight Congress MLAs, two independents (who have joined the party) and one from the TDP openly declaring their support for the ruling party. 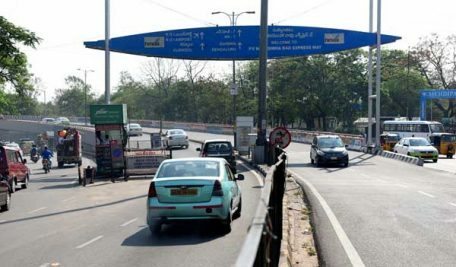 Result — TRS, in the run-up to the Lok Sabha elections that are just a little more than a fortnight away, will be in the driver’s seat with an anticipated over 20 per cent jump in its vote share, compared to its vote share in the 2014 Lok Sabha elections. The TRS registered a vote share of 34.94 per cent in the 2014 Lok Sabha elections and jumped to 47.41 per cent during the 2018 Assembly elections held in December. 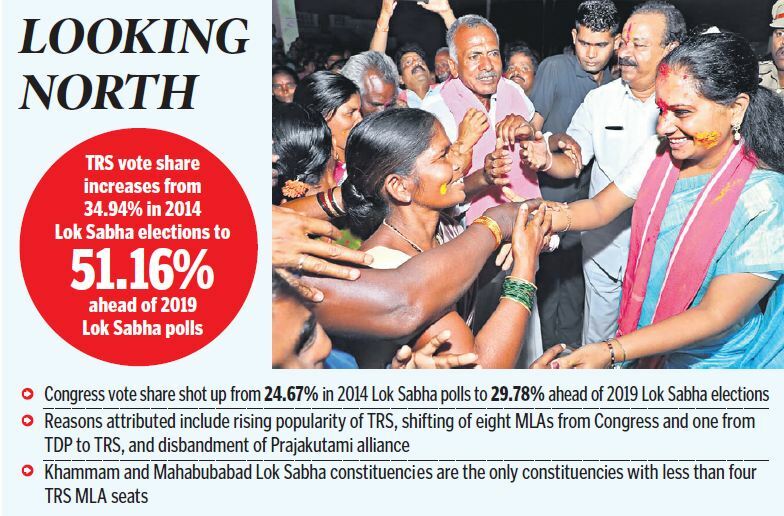 But when one takes into account the vote share of the nine MLAs who shifted loyalties to the ruling party, the vote share of TRS shoots up to 51.16 per cent in the run-up to the 2019 Lok Sabha polls. This is without taking into account the TDP votes that would come the TRS way since the party has not put up any candidate in the Lok Sabha elections. On the contrary, Congress which had a vote share of 24.67 per cent in the 2014 Lok Sabha elections, managed 33.05 per cent in the 2018 Assembly elections, but then it is a combined figure with Prajakutami partners TDP, Telangana Jana Samithi and CPI. Ahead of the Lok Sabha elections, the vote share of Congress has been reduced to 29.78 per cent after its eight MLAs abandoned the party with the intention of joining TRS, seeking a better future for their constituencies. With the alliance being disbanded, the vote share is only likely to drop drastically in the April 11 Lok Sabha polls. In the 17 Lok Sabha constituencies of the State, TRS registered a clean sweep in three constituencies — Karimnagar, Nizamabad, Mahabubnagar — winning all seven Assembly constituencies in the 2018 Assembly polls. With more than five MLA seats in its kitty from each of the other 11 Lok Sabha constituencies, TRS enjoys people’s verdict in its favour and the Opposition parties might need a miracle to win even one of these seats. The remaining two MP seats are Khammam and Mahabubabad where TRS secured less than three Assembly constituencies during the recent Assembly elections. But following the recent shifting of loyalties of Congress, TDP and independent MLAs along with support from AIMIM, the TRS’ support base has increased in both the Lok Sabha constituencies. Against one MLA elected in Khammam Lok Sabha constituency, TRS now enjoys support of three more MLAs — K Upender Reddy (Palair), Vanama Venkateshwar Rao (Kothagudem) and Sandra Venkata Veeraiah (Sathupalle). Besides, Nama Nageshwar Rao from the TDP has joined the TRS and has been fielded as the party candidate from Khammam Lok Sabha seat, further strengthening the party. Similarly, the strength of TRS increased from three to five legislators in Mahabubabad Lok Sabha constituency after Pinapaka MLA Rega Kantha Rao and Yelandu MLA Haripriya Banoth extended their support to the ruling party. When votes polled by these MLAs are taken into account, the vote share of TRS can be expected to increase from 5.18 lakh to 7.88 lakh in Khammam Lok Sabha constituency and from 4.9 lakh to 6.33 lakh votes in Mahabubabad.